Indians closer Cody Allen (2-4) allowed six runs after getting two outs in the ninth, the last three charged on Votto’s sharp hit to right off Dan Otero. Adam Duvall also doubled in two in the ninth, while Jose Peraza and Eugenio Suarez each hit an RBI single. 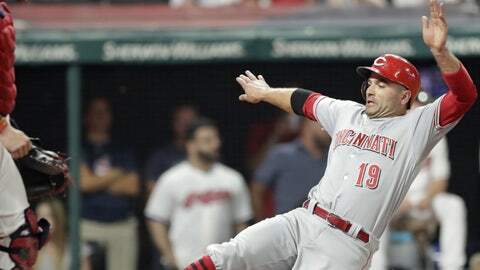 Cincinnati had seven straight batters reach with two outs, and the inning didn’t end until Scooter Gennett ran into the third out at third base on Suarez’s single. Cleveland’s bullpen entered Tuesday with a 5.13 ERA, better only than the Rockies (5.28) and Royals (5.35). Bauer was brilliant, striking out 12 over eight scoreless innings in his first appearance since being named to the All-Star team for the first time. The right-hander allowed three singles, walked one and didn’t allow a hit until Jesse Winker hit a one-out single in the fifth. Bauer became the second major league pitcher to post seven consecutive quality starts with eight-or-more strikeouts and no homers allowed, according to the Indians. Pedro Martinez set the record with eight in 2002. Former Cleveland reliever Kyle Crockett (1-0) recorded the final two outs in the eighth, and Raisel Iglesias worked the ninth for his second save in two nights and his 19th of the season. Francisco Lindor hit his fifth leadoff homer of the year and fellow All-Star Jose Ramirez added a solo shot as the Indians scored twice in the opening frame against righty Sal Romano. Ramirez’s home run was his 25th, marking the eighth time in Indians history the milestone has been reached in the first half of a season. He doubled in the eighth to match Lindor atop the AL with 52 extra-base hits. Lindor, who has 24 homers, and Roberto Perez drove in runs in the second without the benefit of a hit. Romano worked 7 1/3 innings and allowed five hits. Cincinnati is 38-36 since interim manager Jim Riggleman took over for Bryan Price on April 19. Indians: RF Lonnie Chisenhall received a second medical opinion on his strained left calf. The diagnosis of a Grade 3 strain with an 8-10 week recovery period was confirmed. Reds RHP Tyler Mahle (7-6, 3.66 ERA) takes on Indians RHP Carlos Carrasco (9-5, 4.28 ERA) in the series finale. Mahle hasn’t lost since May 20, going 4-0 in eight starts, and has an NL-low 2.04 ERA since June 1.